Budgens Poringland is probably the biggest Budgens i have ever seen. It looks like a a (small) supermarket. You know it has a car park and seems like it is pretty big, but in fact it's not THAT big. Well anyway, it's bigger than one you might find in a local promenade. Thanks Victoria for sending in this picture, it's nice to receive a picture from a more rural part of the UK and a good way to kick off the new year. Happy new year. Now I agree with Victoria who says "a surprisingly large selection for a small supermarket". Yes, it is bigger than the smaller shops, but isn't the biggest we have seen from a reseller of this size. Looking back to the previous Budgens, a shop that is a bit smaller had arguably a better range. There are two things that I am absolutely loving about this arrangement! A reduced sticker! - the first appearance in a flour arrangement, not that the value of flour should ever be reduced, but it is the first on the site. On the other hand, there are items which are out of stock, which i am not a fan off. Overall not a bad arrangement, but not great. Thanks to Odhrán for the latest pictures. He's an Irish man living in London, who seems to miss Irish flour that much he moved to a place that has a Budgens which sells Irish flour! Ok, it might be a coincidence, but I'd like to think the love of flour was the main reason. A lovely little spread that seems to be in a special "taste of ireland" section. 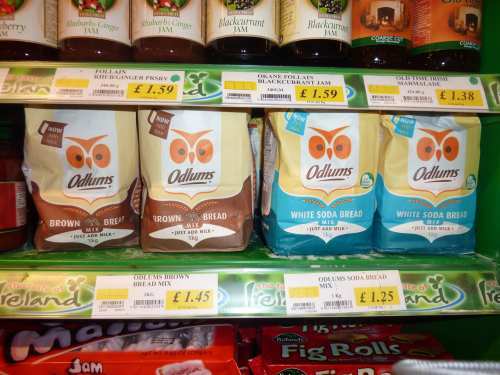 Poor Odlums would probably rather be playing with all the other flours. 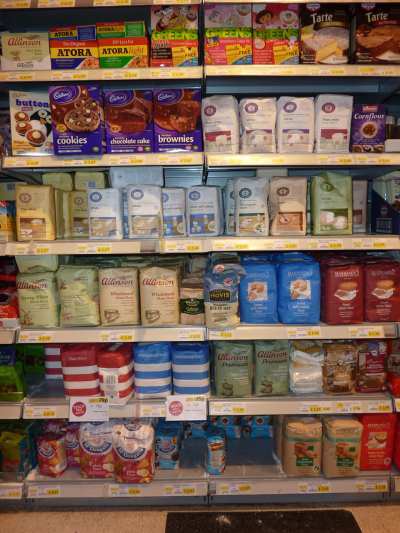 "We have a main shelf with a large and colourful selection of flour in the home baking section". ... and he is right. a lovely range of colours, and i like the hoops design on the Budgens home brand. They have a good range, could do with a bit of filling and tidying, but otherwise not bad at all. 7/10 - I added a bonus point for the international flour, but took it away for being segregated.